License information: all screencasts presented here are licensed under a Creative Commons CC-BY 4.0 license. Feel free to reuse then, while citing the author (Olivier Aubert). Annotate with SVG graphics and overlay them over the video (2:12). Use multiple video players (1:00). Quickly validate a shot segmentation (1:27). 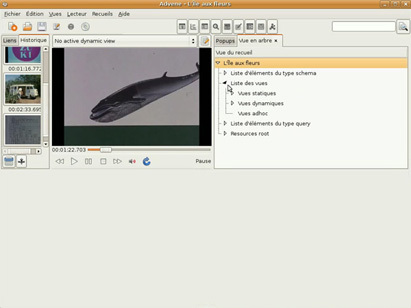 These small screencasts quickly highlight some features of Advene. How to annotate a video with SVG graphics, and display them over the video while playing it. You can have more than 1 video player in Advene. The primary video remains the time reference, but additional players can be used, to display for instance a different video stream of the same event, or to visualize parts of the same movie where the exact same footage is reused (hint: look for a car in Mulholland Drive). Learn to use the dedicated view to validate a shot segmentation (or any segmentation where annotations are supposed to be adjacent). Note: these screencasts were made with Advene 0.24. Some things may have changed in new releases. This video introduces you to the Advene interface. You will learn how to start Advene and then will be guided through the main functional areas with the aim to give you a feel how the annotation process is handled in Advene. You will also learn about the important concept called “view”. 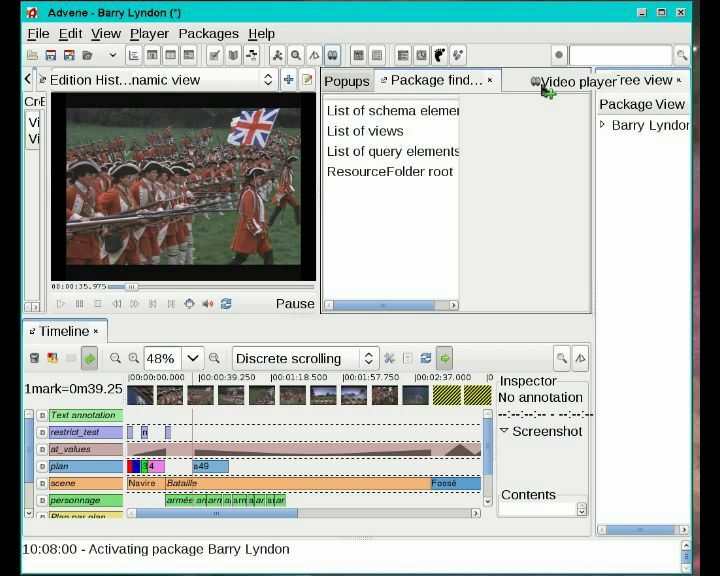 A view enables you to establish, manipulate and visualise annotations. You will be introduced to the “tree view”, the “time-line view” and the “transcription view” and how you can customize views in Advene. At the end you will also learn how to make most out of the user guide offered by Advene. 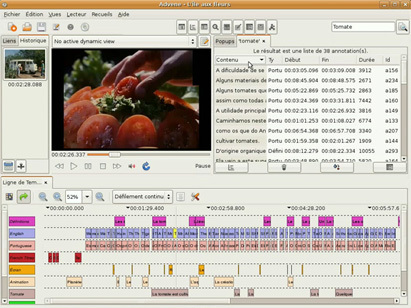 In this video you will learn about different ways on how to use the timeline. 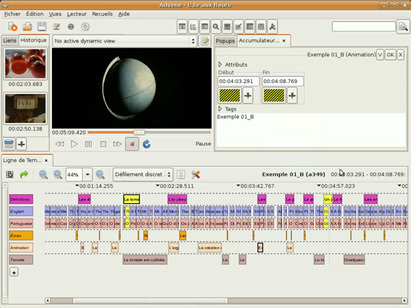 The timeline allows you to create and visualize annotation types as well as annotations. You will be also shown how to display, create and edit relations. 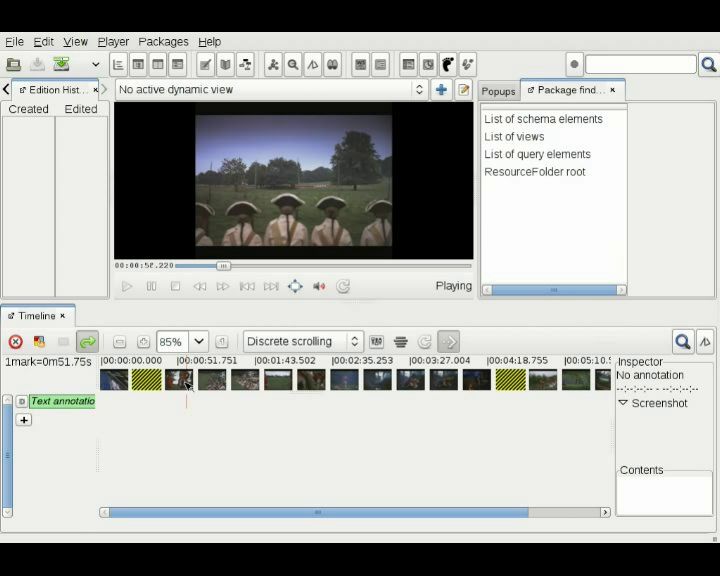 In this video you will learn how to annotate a video using the "text editing view". You will also be shown how to transform the created text into annotations. In this video you will learn how to read a static view as well as how to activate a dynamic view. Particular attention will be given to the influence of relations on the behaviour of dynamic views. In this video you will learn how to create static and dynamic views. In this video you will learn how to search in the annotations content.